A is for ABC Blocks, B is for Blessings Bracelet, C is for...well, you get the idea! A is for ABC Blocks, B is for a Blessings Bracelet, and C is for...well, you get the idea! Save this fun gift-idea list featuring items from local businesses. A is for ABC Blocks at Brilliant Bumble Bee. Classic, timeless, and eco-friendly! B is for Blessing Bracelets at Sapphire on Spring. Perfect for the woman who has everything. 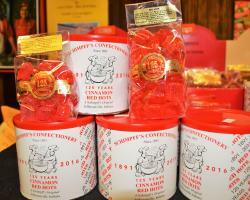 C is for candy at Schimpff’s Confectionery. Red hots and chocolates, for you AND for me! D is for Dapper, for that’s what he’ll be, when you buy clothes for him at HIM Gentleman’s Boutique. E is for essential oils of every kind. Seeds and Greens Natural Market and Deli is where you can find. F is for faux fur vests at Dress and Dwell. They will help keep her warm and well. G is for gallery, the Copper Moon kind. Sculptures and paintings—art that’s divine. H is for honey, found at Pearls on Pearl. Sweet and delicious, and au naturale. J is for jewelry, women’s accessories and fashion. All found at Strandz and Threadz, where chic is a passion. K is for keepsakes, furniture, and dishes. 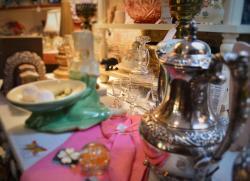 Sugar Maples Antiques & Gifts will grant many wishes! L is for leggings from Colokial Boutique. They look fabulous, stylish, and sleek. M is for monogrammed hats and T-shirts. VIP Quality Awards and Gifts will do all the work. N is for necklaces, beard oils, and soaps. You will find these gifts at True North. O is for onesies with the words “sous chef.” Cute and adorable, found at MESA. P is for pottery that you can paint. Silica Ceramic Studio’s ceramics are pre-made. Q is for Quills…coffee that is. Gift cards are great for your hard-to-please list. R is for Rookie’s. Their buttery “little flowers” are the best cookies! S is for socks found at Regalo Gifts. Stylish and sassy, for her or for him. T is for tanning, facials, and pedi’s. A gift certificate from The Springs Salon and Spa will be quite the envy. U is for Uptown Art, where you’ll paint like a pro. Wrap your creation up with a bow! V is for vintage clothing and more, found at the Mariposa Consignments store. W is for wine, award-winning, too. 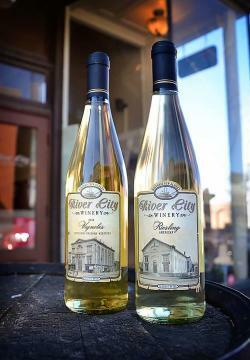 River City Winery is waiting for you! X is for X-mas ornaments, stockings, and décor. Blessings on Spring is a very special store. Y is for Yamaha keyboards, guitars, and gear. Maxwell’s House of Music makes musicians all year. Z is for zest, which is what you will get, when you buy tasty oils and vinegars from The Olivet. Want more shopping ideas? Read this holiday shopping blog and visit our Shopping page. Happy Holidays and happy shopping in SoIN!